White corn, commonly referred to as sweet corn, is in season in the United States between May and October. While grilled corn is also fairly common, boiling is the most common preparation for white corn, as it preserves the corn's natural flavor. Traditionally served with butter and sprinkled with salt and pepper, white corn makes an excellent side dish for a variety of main courses, including grilled meat and fish dishes. Fill a large saucepan or stockpot halfway with cold, clean water. Add 3 tbsp. salt to the water and cover the pot. Bring the water to a rolling boil over high heat. 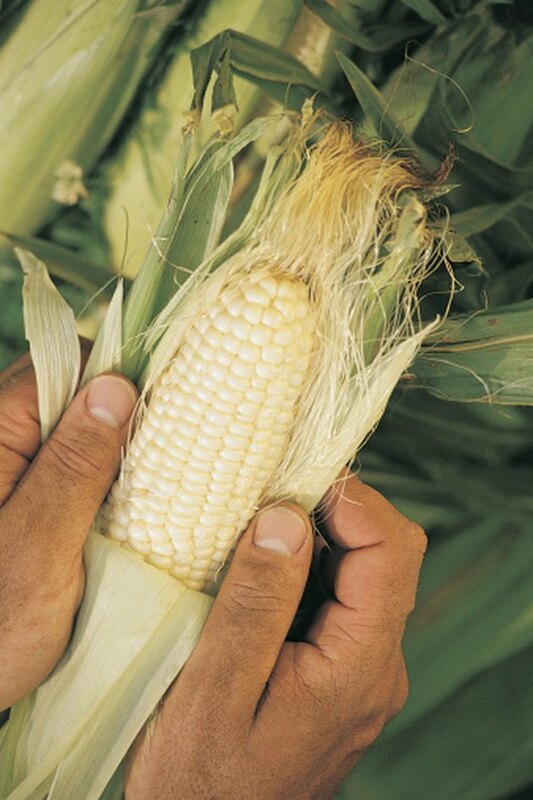 Shuck the corn with your hands, tearing the green husk away from the corn, peeling the husk in layers if necessary. Wet a paper towel and rub the corn to remove any of the fine silk, which are the stringy bits often stuck to corn on the cob before cooking. Discard the paper towels. Place the white corn in the saucepan or stockpot using a pair of heavy tongs. Cover the pot and return the water to a rapid boil. Boil the corn for seven minutes with the top on. Remove the corn from the boiling water and transfer it to a large serving platter or plate. Once the corn is cool enough to handle, pat the corn dry with paper towels and serve right away. For extra flavor, add 1/4 cup white wine or vegetable or chicken stock to the cooking water before bringing it to boil.